After the pumpkins have been thrown on the mulch pile and the Thanksgiving turkey is almost ready, it’s time to hang those holiday lights. Festive lighting can make a great accent to any well-designed landscape. LED lights last a lot longer than incandescent lights, and they last longer, and are more cost-efficient. LED lights also come in a variety of styles such as chains, snowfall, icicle and those that flash. Please waterproof: Make sure that all of your connections are off the ground, and waterproofed by using silicone or petroleum jelly. I wrap grocery store bags around the two connecting cords for further protection and to ensure the connection is protected from the elements. There are a lot of websites recommend various limits on the number of lights you should hang on outdoor trees. Most recommend 100 mini lights per foot of tree height, and if you are lighting an evergreen tree, you need 25 percent fewer lights. This depends on whether you are using LED or incandescent lighting. Typically, mini lights with 50 lights per 20.4 watt string will allow 10 strings to connect together. Mini LED lights with 25 lights per 2.4 watt string can handle 175 strings. Test your lights. Always remember to test your lights before hanging them; it’s a lot easier to test lights in your garage than discovering that they don’t work when you are 20 feet up in a ladder. Evergreen trees are fairly simple trees upon which to string lights. It’s just a matter of starting from the bottom, and winding your way around to the top of the tree. As you are working your way to the top, be sure to weave the light strand under one branch then over the next branch. You also want to tuck the strand inwards toward the center of the tree every so often. All this tucking and weaving insures that the strands don’t flop off the ends of the branches when it gets windy, and also helps to light the tree more evenly. When stringing a deciduous tree, you also want to start at the bottom, but begin by wrapping the first strand around the trunk until you get to the first set of branches. Simply run the next strand up the branch on one side as far as you can safely reach, and then come back down the other side of the branch to the trunk. Connect new strands to add more lights, and go all the way around the tree this way. Light timers allow you to program the time (or times) the lights come on, and set the duration they are on and off. If you set your lights up around Thanksgiving, twilight occurs around 6 p.m. By Christmas it’s around 5:30 p.m., so you will want to adjust the start times occasionally. Sasanqua Camellia (Camellia sasanqua), the Fall blooming camellia continues to bloom until about December. 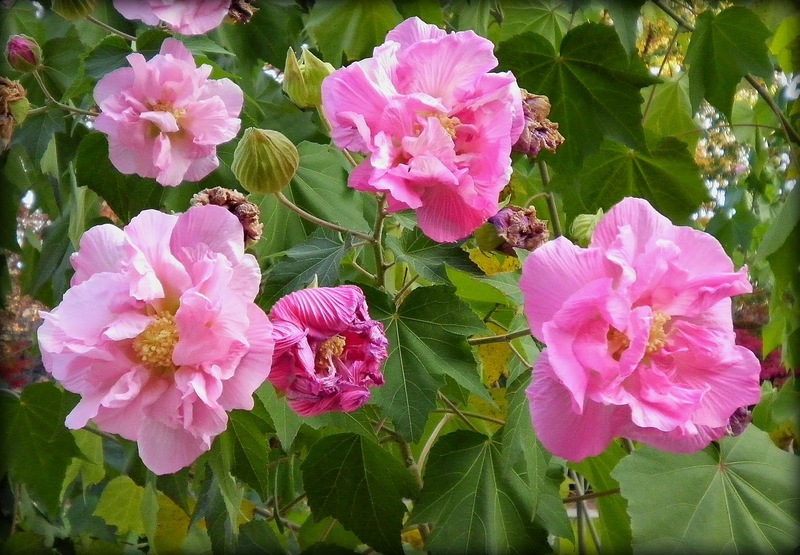 Marsh rose/confederate rose (Hibiscus mutabilis) not a true rose, this large perennial, has peaked at the end of October, and continues to bloom until we receive a frost. Autumn Cherry (Prunus autumnalis), tiny pink flowers begin opening up, and will peak in December. Encore Azlaea (Rhododendron azalea “Encore”), Continue to add color to Springmoor’s Campus. Look for the following varieties on our campus: Autumn Belle a two toned double pink dwarf, Autumn carnation, a medium pink single blossom, Autumn cheer looks a lot like the old Hershey Red. Autumn chiffon a two toned pink, and Autumn embers a hot red single blossom. Start thinking about shutting down your irrigation system for the winter, turn the water meter off at the street, and bring the backflow preventer into a garage or other place where it will be protected. Weed and feed your fescue lawn; you can apply products that feed the lawn during the upcoming winter months, as well as, keep the pesky winter weeds out. Fall bulbs such as crocus, daffodil, tulips, and allium can still be planted. Large ball, and burlap trees at your local nursery have gone dormant after the first frost so now is a great time to plant trees.